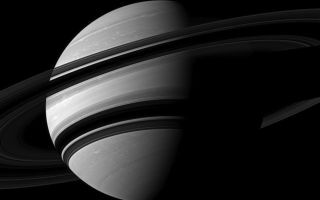 In this space wallpaper, the Cassini spacecraft takes an angled view toward Saturn, showing the southern reaches of the planet with the rings on a dramatic diagonal. The image was taken with the Cassini spacecraft wide-angle camera on June 15, 2012. North on Saturn is up and rotated 16 degrees to the left. This view looks toward the southern, unilluminated side of the rings from about 14 degrees below the ringplane. The rings cast wide shadows on the planet's southern hemisphere. The moon Enceladus (313 miles, or 504 kilometers across) appears as a small, bright speck in the lower left of the image.